When the topic of most important position in sports comes up, the debate typically focuses on two positions — quarterback and hockey goalie. And while netminders don’t get the attention of QBs, they’re importance certainly merits discussion. If you’re playing the Penguins and Sidney Crosby gets loose on a breakaway, just one guy stands between the puck and the back of your net — and if it’s in overtime of Game 7, between the puck and your season. 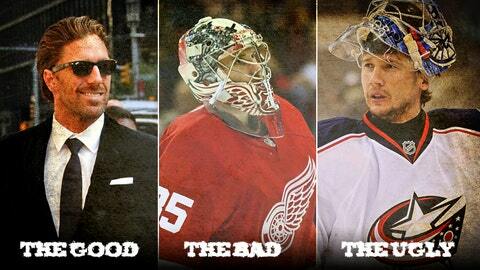 Better have a good goalie. Goalkeepers are also similar to their football counterparts in that everybody’s gunning for them, injury is always a risk, success can be very rewarding — and failure equally painful. And on Wednesday, we saw all of these things on display in one eventful day for NHL goalies. Since debuting with the Rangers as a 23-year-old in 2005, Lundqvist has been among the league’s top netminders, leading the league in wins once, appearing in three All-Star Games and winning the Vezina Trophy following the 2011-12 season. And while he has struggled this season (8-11-0, career-worst 2.51 GAA), he was rewarded by New York on Wednesday with a seven-year, $59.5 million extension which will make him the league’s highest-paid goalie. "About eight months ago I sat down for the first time with my family and my agent and kind of discussed my future," Lundqvist told The Associated Press after practice Wednesday. "There were two things that became really clear to me: No. 1 was I really wanted to win the (Stanley) Cup here in New York. It’s my biggest goal and my biggest dream and what really pushes me right now to work harder. Secondly, I want to be a Ranger for life. To picture myself anywhere else, it was just wrong and it was never an option." This new deal would keep Lundqvist in a Blueshirt until he is nearly 40. And despite Lundqvist’s struggles — he has sat the last two games in favor of backup Cam Talbot — Rangers coach Alain Vigneault said that Lundqvist will start Thursday night at Buffalo. The news was already bad for the Detroit Red Wings, taking the ice Wednesday night without their top two scorers — Henrik Zetterberg and Pavel Datsyuk. Certainly, the pressure was on Howard more than ever against the Flyers. And for 40 minutes, the American was up to the task, holding Philadelphia to two goals and carrying a 3-2 lead into the third period. But as has been the case so many times this season, Howard and the Red Wings collapsed in the game’s final 20 minutes, this time surrendering four goals (three by Howard and an empty-netter) and losing 6-3 at home. It’s a familiar story for Howard, who entered the season with lofty expectations. After leading the league in shutouts last season with five and establishing himself as one of the top US goalies, Howard began the 2013-14 season in a new — and weaker — conference with aspirations of making the US Olympic team. He is 6-8-6 in 20 starts, tied for 27th in the league in wins but with goalies who have made 7, 9, 13 and 18 starts. He has two wins since Halloween. His 2.70 GAA and .909 save percentage are his second-worst since he became a No. 1 in 2009-10. And of his 53 goals against, 25 of them — a whopping 47 percent — have come in the third period or overtime. Bobrovsky is another goalie struggling on the ice. But unlike the other two, he looks like he’s starting to turn things around in Columbus — but also won’t be able to complete the U-turn for some time. The reigning Vezina Trophy winner is 10-11-2 on the season, but has found himself on the winning side of three of his last four contests, twice holding opponents off the scoreboard in the process. But on Wednesday the Blue Jackets’ star found himself on something else — the injured reserve list. Injured doing the splits while making a save against Tampa Bay on Tuesday, Bobrovsky is expected to miss four to five weeks with a groin strain, throwing his availability for Russia in the Olympics into question. The Blue Jackets now turn to backup Curtis McElhinney (1-3-1, 2.34 GAA) as their No. 1 goalie.